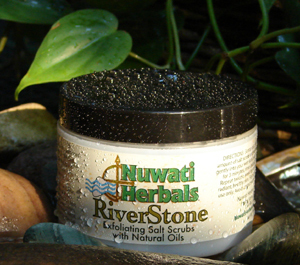 As the water smooths stones in the rivers of Mother Earth, this scrub will smooth and moisturize your skin. It just won't take as long! Ingredients: Yarrow, Plantain, Oregano, Calendula, Mullein, White Willow, Yellow Dock Root, Lemon Balm, Chaparral, Arnica, Olive Leaf, Extra Virgin Olive Oil, Avocado Oil with Solar Sea Salt. Directions: Scoop out a small amount of salt scrub and gently massage into your wet skin. Leave on for 3 minutes, rinse and pat dry. Repeat twice a week for smooth, radiant, healthy skin.